This book presents first-hand field research by a team of designers at the National Institute of Design, Ahmedabad, from 1979 to 1986. In carrying out this path-breaking project the team has set new standards of quality in craft documentations in India and elsewhere. A rich material culture based on traditional bamboo utilization has been observed with deep empathy and recorded in a meticulous manner using expressive sketches, structural diagrams, photographs and field notes, all of which form the core of the book's contents. 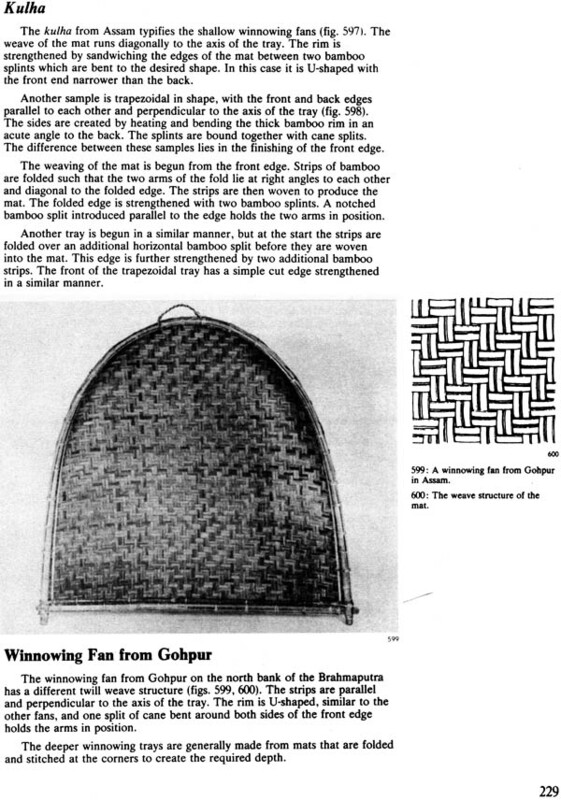 It is richly illustrated with photographs and 400 line diagrams that reveal the intricate structure and technology, as understood by the people of the Northeastern region of India. 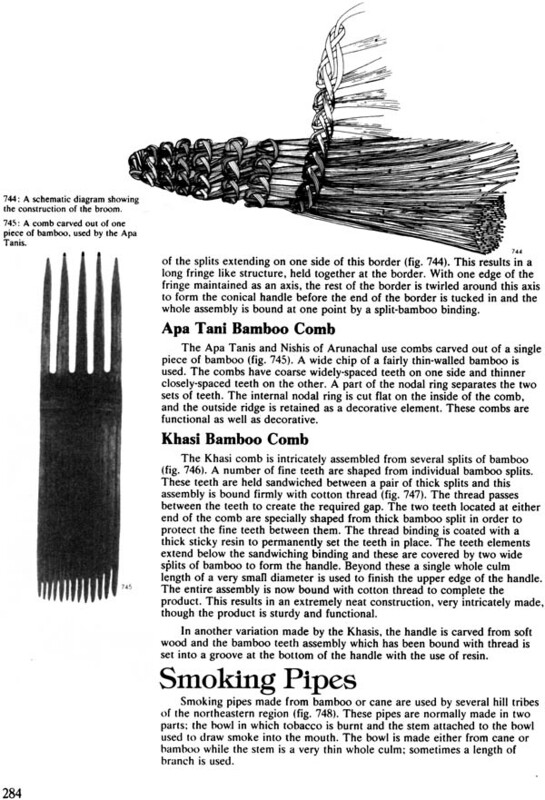 The multi-level analysis has revealed numerous exciting and unique properties of bamboo and vane that hold promise for the opening up of many innovative applications for the future use of this material. The detailed technical index and subject index help draw out these qualities as a knowledge base to support future innovation. 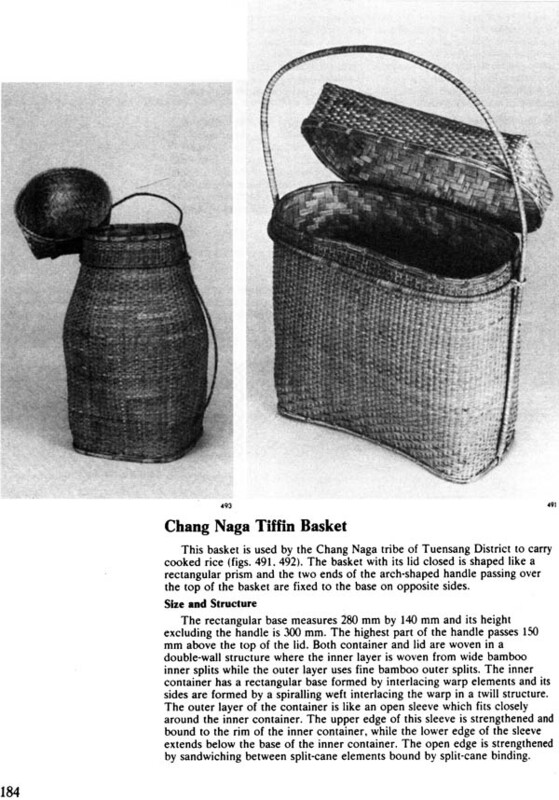 It covers the use of bamboo and cane in local housing and in building bridges, agricultural tools and containers for food storage and processing, fish traps and livelihood accessories used by the diverse people of the Northeastern region. 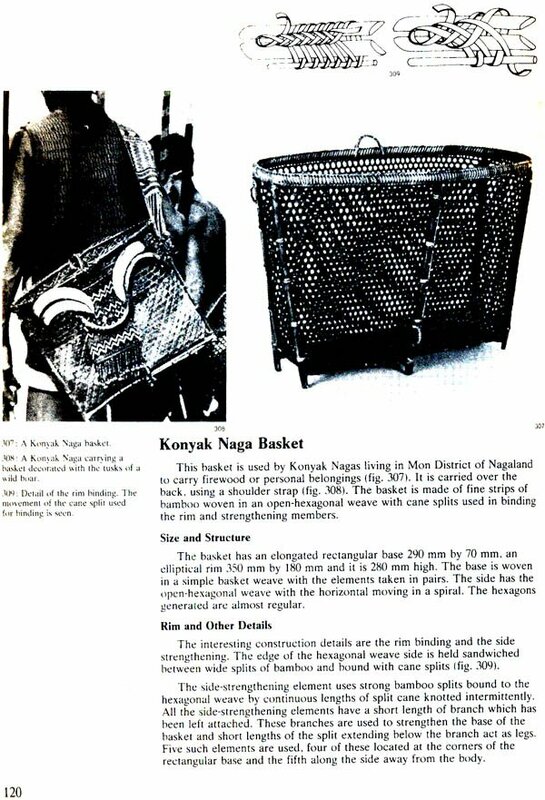 Over 400 baskets collected are in the permanent archives of the National Crafts Museum in New Delhi. This is a source book for architects and designers wishing to work in bamboo and cane, reprinted in 2004, in a soft bound and easy to carry format to cope with the growing demand for knowledge about bamboo for sustainable economic development in India and the world. Subsequent work done by the Institute's faculty and students also helps demonstrate the key role that design can play in the complex development process of this major sector of our economy. M.P. Ranjan born in 1950. He completed his schooling at Madras before joining the National Institute of Design as a student of furniture design in 1969. 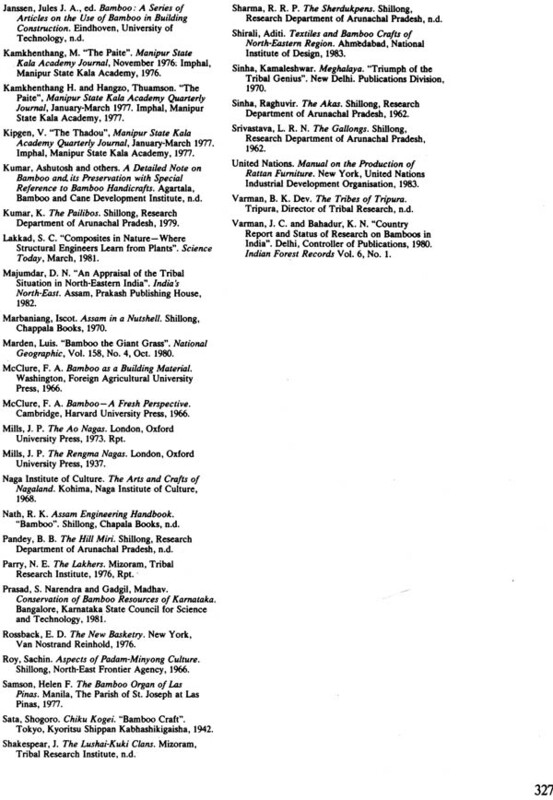 He worked at institute between 1972 and 1974. He conducted his freelance design practice at Madras between 1974 and 1976 where he design wooden toys, furniture and exhibitions. He came back to the Faculty of Industrial Design at the Institute in 1976 where he has been involved in evolving and conducting courses in Geometry, Design Methodologies, Product and Furniture Design, Besides design education, his interests are in visual mathematics, structures, materials and technologies. He is technologies. He is interested in the area of craft tradition, craft design and its contemporary significance in the Indian context. Nilam Iyer born in 1954. She was awarded her diploma in Product Design from the National Institute of Design in 1977. Worked with the Community Science Centre, Ahmedabad between 1977 and 1978, developing teaching aids. She joined the Faculty of Industrial Design in 1979. Her interest in crafts grew out of her involvement in The Rural University experiment at Jawaja where she products. Her interests are in design education, especially in technologies relating to a variety of craft sectors. Ghanshyam Pandya Born in 1954. He completed his degree in Architecture from the centre for Environmental Planning and Technology, School of Architecture, Ahmedabad, in 1979. His thesis project on Wooden Architecture of Gujarat, studying 150 to 200 year old buildings, kindled his interest in ethnic architecture materials and technologies. 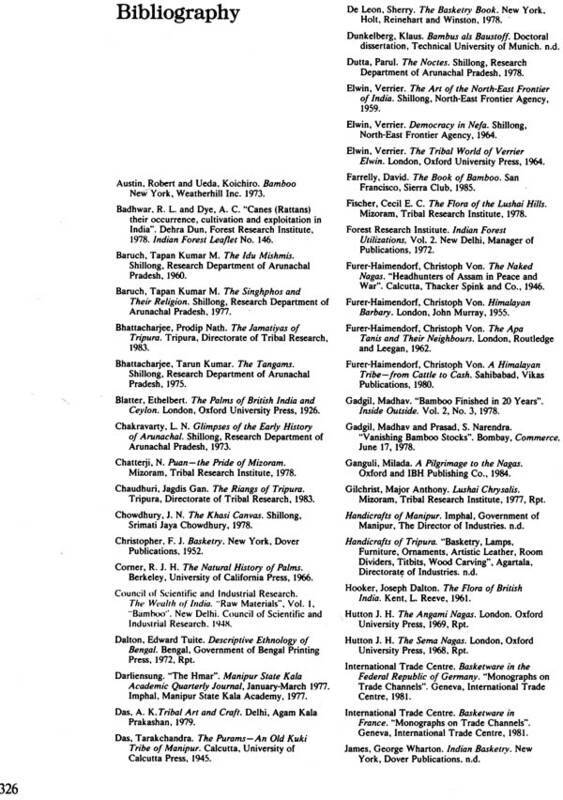 He had since then been associated with the Institute as a project associate and visiting faculty. He conducted an independent architectural practice at Ahmedabad through which he worked on a number of building both private and public. His interests included interiors, exhibition design, appropriate building technologies and low-cost housing. Died in1991. Bamboo and cane are remarkable natural materials. They are a renewable resource which India has in abundance. Special features such as pliability and linear strength have been used to advantage by craftsmen and local engineers in many creative ways. The skills developed over the centuries have been passed on, like other crafts, without the assistance of formal instruction. These skills, and the experimentation behind them, are not very well documented and not easily learnt by those who do not have the privilege of being apprenticed to accomplished craftsmen. 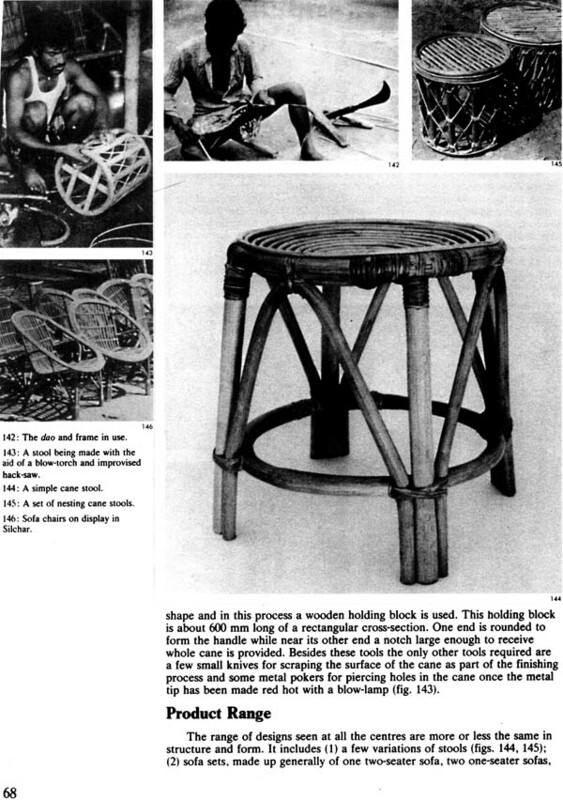 It may seem that all the possibilities of using these materials must have been exhausted because of the long and close inter-action of people's lives with the environment where bamboo and cane are found in magnificent abundance. However, it is almost certain that this is not so. 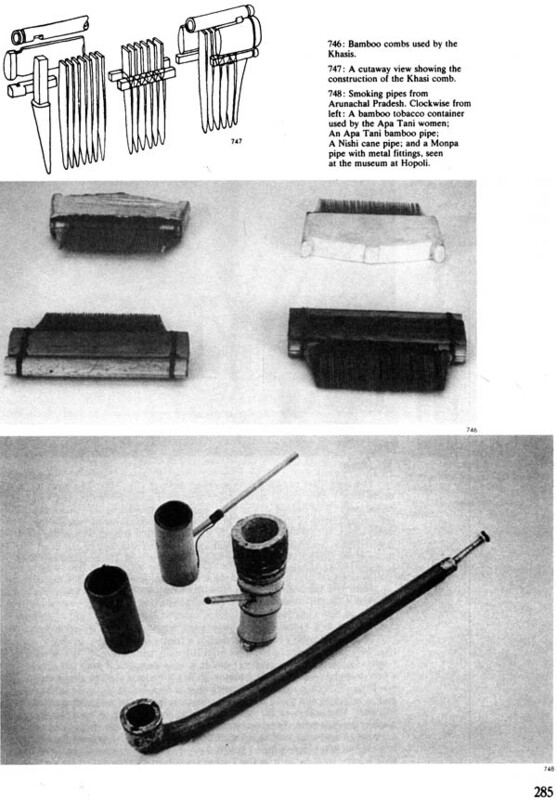 The needs of things and products change with time; equally, the techniques of handling the material, sometimes in combination with other materials which were not available to the original craftsman, provide new vistas for design creativity. As the authors of this excellent book point out, in spite of the large resource which India has, its share in the world's trade of products made of bamboo and cane is rather small. Clearly, there is a great deal of room for new initiatives and enterprise, and towards that end this study of what exists is an extremely useful contribution. Given the special properties of bamboo and cane and the beauty and purposes for which these materials are already being used, as evidenced by this book, one feels sad, sometimes, that this remarkable resource should often end up as a prosaic product like paper. Perhaps there are varieties which can be best used for this purpose. On the other hand, it should also be possible now to choose and specially propagate varieties, by using new methods of propagation, which will enhance the room for structural and craft innovations. 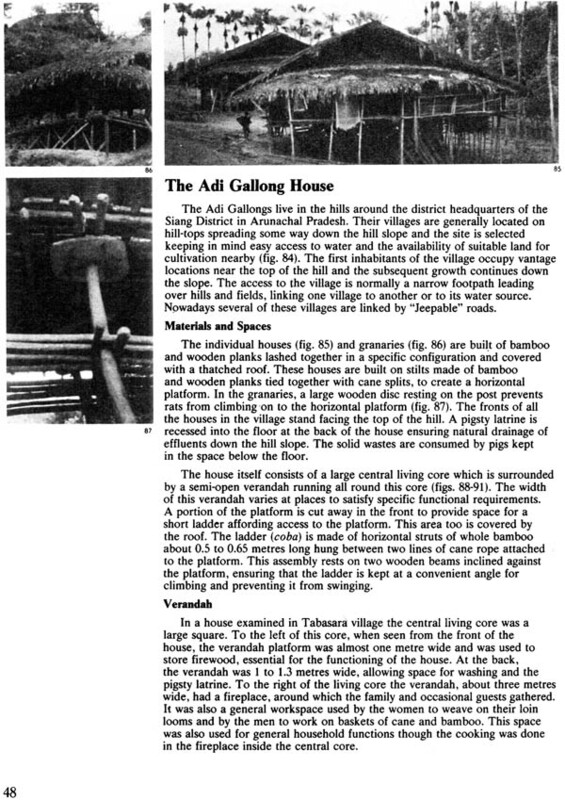 A lot of structures in the northeast and other parts of the country do depend on bamboo and indeed it is almost sacrilegious to use concrete and steel for habitations in places where bamboo is, or could be, available in abundance. Modern designers and architects have not yet expended any real effort in that direction. Perhaps this delightful book will encourage some of them to go further. I would like to compliment Mr. M. P. Ranjan and his colleagues from the National Institute of Design for having engaged in this research project and for preparing this book. The book would be of interest to designers, craftsmen, architects, social and economic planners and, yes, even to scientists, besides a large number of people interested in the crafts and culture of this land. At the National Institute of Design (NID) several faculty members have been deeply interested in the craft traditions of our country. This interest grew out of our search for meaningful tasks for designers and design students in a developing country such as ours. The initial efforts were particularly visible in our textile design discipline where a number of pioneering projects were conducted in the handloom sector. These revealed the benefits that the intervention of trained designers working with marketing agencies could bring to craft communities. Subsequently several projects were handled in the handicrafts sector with materials such as leather, bell metal and turned wood. These explorations brought home the fact that India's traditional skills and design repertory could well be the source of livelihood and development for millions of rural craftsmen. 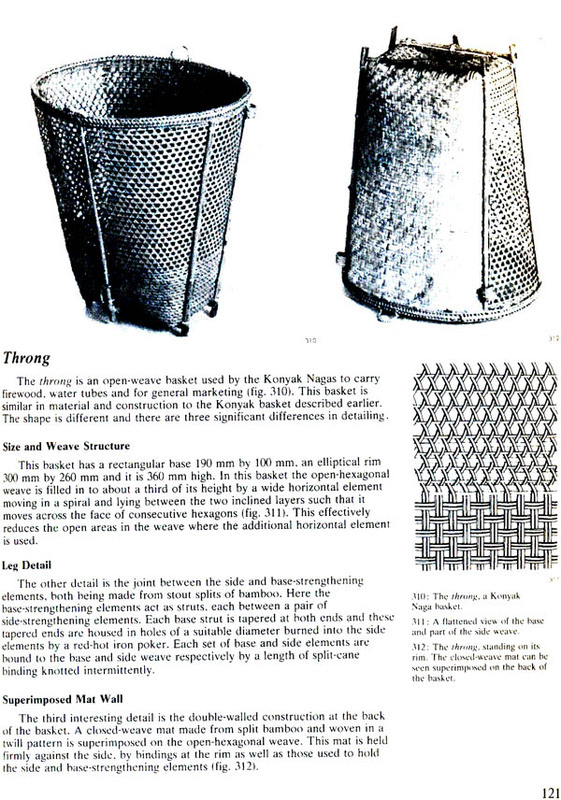 It was further apparent that besides appreciating the aesthetic qualities of a particular craft, designers would need to develop a strong understanding of the technical possibilities and limitations of the materials, tools and techniques used. 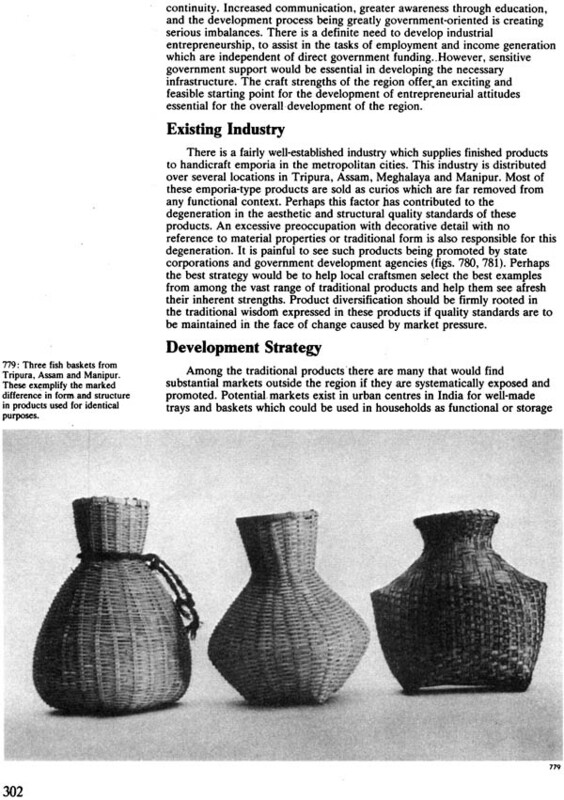 This understanding was an essential prerequisite for any designer's interaction with crafts communities towards product innovation and diversification. In a capital-starved economy the designer had to work within the framework of existing technologies, locally available materials and skills. The produce of the crafts communities on the other hand had to compete on equal terms with new industrial products. The social milieu in which the craft is practised and the entrepreneurial capabilities of craftsmen were further complexities. Our work with Gurjari, the marketing wing of the Gujarat State Handloom and Handicrafts Corporation, and intervention at Jawaja block of Rajasthan as part of "The Rural University" experiment are some outstanding examples of design intervention. 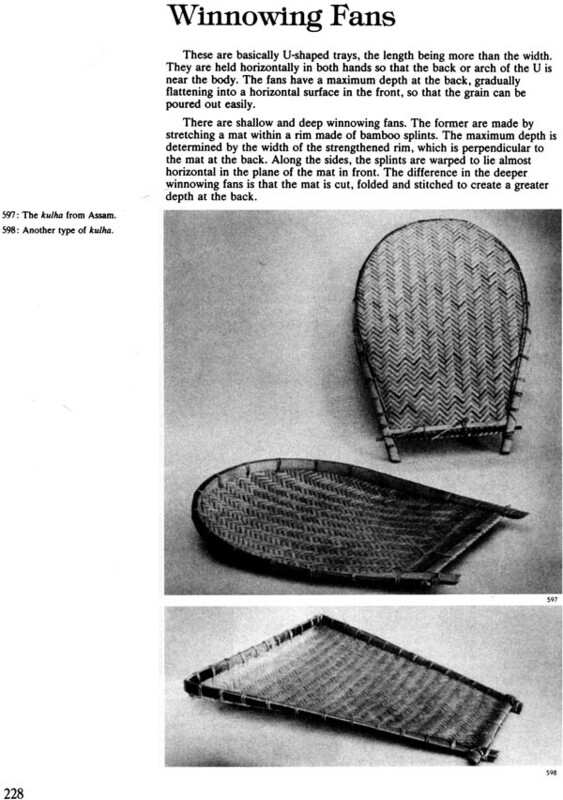 The above mentioned observations formed the backdrop of this study of the bamboo and cane crafts of the northeastern region of India. In 1979 the All India Handicrafts Board, now called the office of the Development Commissioner of Handicrafts, Government of India, asked NID to study the crafts of this region. This was immediately seen as an exciting and challenging opportunity as one of our colleagues had just then completed a preliminary study of the textile and bamboo crafts of the seven northeastern states on behalf of the Northeastern Council. This survey revealed an immense resource of materials, skills and techniques existing as a living tradition. Bamboo being a new material for us our first efforts were to develop an understanding of its properties and limitations. We felt that the best way would be to learn directly from the craftsmen by observations and interactions. We commenced field work in November 1979 which extended till June 1980 with a break of one and a half months in the beginning of 1980. This extensive travel and interaction with local craftsmen led us to the staggering realisation of the immense variety of products, indigenous techniques and constructions that the local mind has evolved over the ages and refined to a fine art. This knowledge had so far remained in the oral tradition of the land being passed on from generation to generation. Our objective while documenting this resource was to try and set out all this information in an organized and retrievable manner. Armed with this basic information, designers can take the next step in the design process. Our own skills of observation and recording in the field improved as we progressed with our study. We had set out with a basic checklist of the type of information needed and with the designer's typical tools such as cameras, sketch books. pencils, pens, note books and measuring tapes. Our field note books filled out with freehand diagrams and notes became a record of our journey and observations. Wherever possible product samples were acquired and periodically transported to Calcutta. Over JSO different products were collected, each being carefully catalogued. After completion of the field work these products were analysed with the aid of an elaborate interaction matrix of products versus attributes and qualities. This phase of analysis and classification was carried out between July 1980 and July 1981. Simultaneously the preparation of all artworks of illustrations, studio photography of products and literature search were carried out at the NID campus. 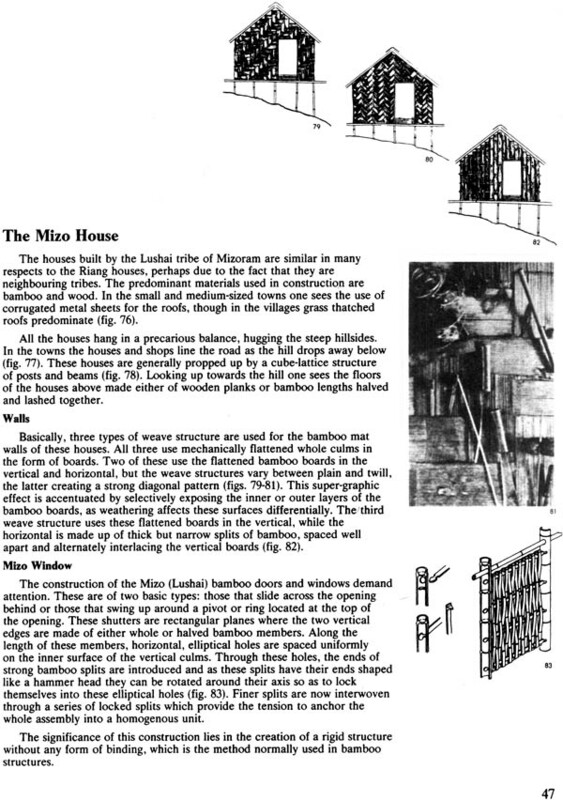 Each drawing prepared for the book illustrates an interesting principle of construction or a specific property of material as exemplified by the particular product. As far as possible the formal proportions of the product or individual elements that make up the product or part have been faithfully retained. 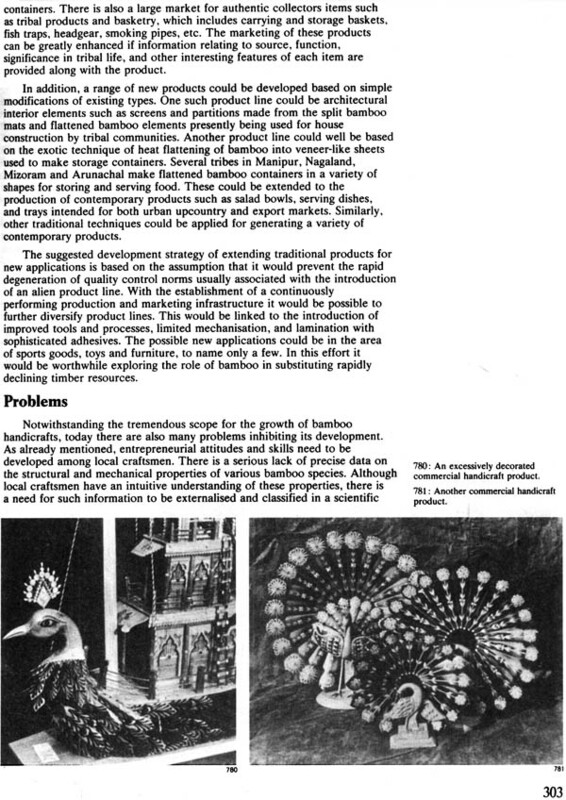 We got an opportunity to supplement our field work in Manipur when the state government of Manipur commissioned us to design their pavilion at the 1981 India International Trade Fair at New Delhi. The final documentation was submitted to the sponsor in May 1982. 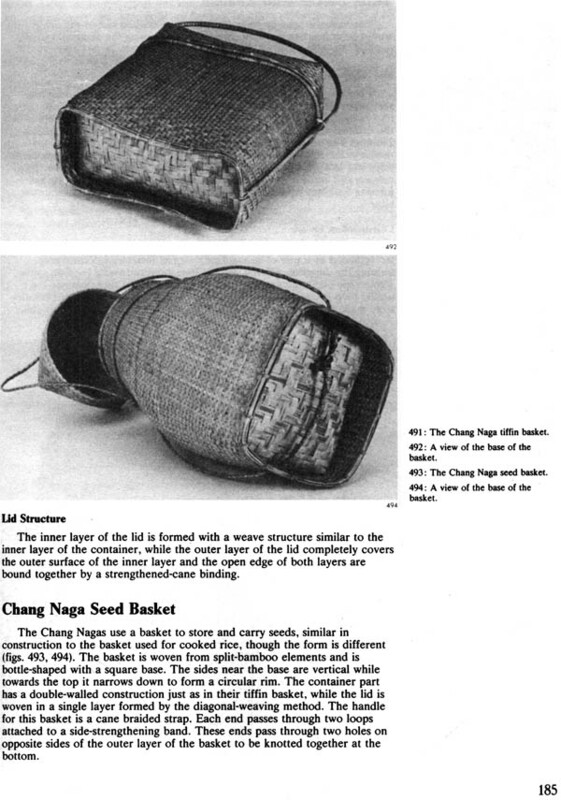 We would like to point out that this study is by no means a comprehensive record of the bamboo and cane products, techniques and craftsmanship resources of the northeastern region. It is but the proverbial tip of the iceberg. It was not our intention to prepare a comprehensive documentation. 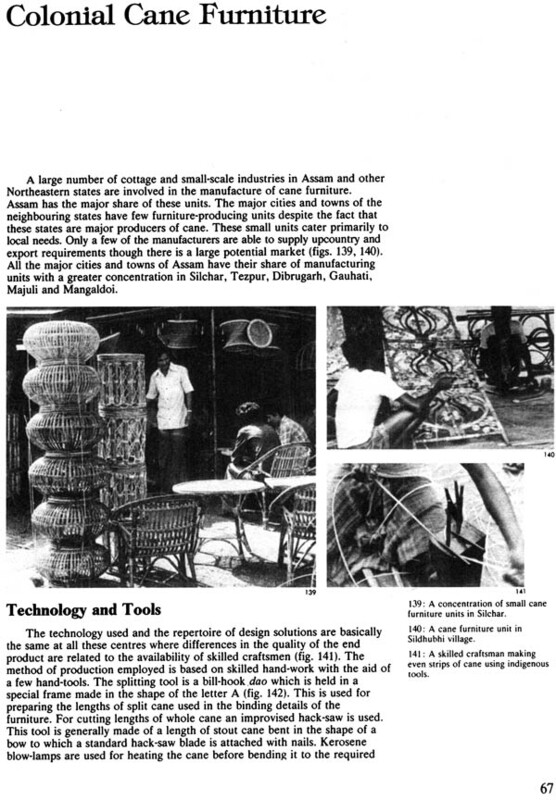 Our object was to develop a sufficiently strong understanding of the materials, techniques and the socio-economic milieu in which the craft is practised so that informed design assistance to crafts communities could commence. We have already commenced product development projects for the state government of Tripura and we hope other designers can join us in using the information presented in this book for the benefit of the craftsmen of the region. 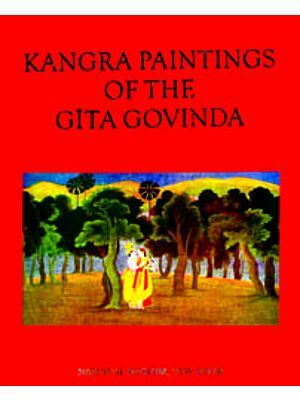 There are many ways to structure the material presented in this book. However, we chose to group the products by their function and structure rather than on a tribal or regional basis. This arrangement, in our opinion, reveals a meta-language that assists in developing an understanding of properties of materials and structures as appreciated by the local mind. Technical information, on various aspects of the materials studied, has been separately included in the appendices. In order to enable readers, from a variety of disciplines, to obtain easy access to the information we have included a technical index and a subject index. These contain a fairly high degree of cross-referencing in our attempt to make the book as "user-friendly" as possible. Besides other designers, the audience that we had in mind include craft trainers and trainees both within the northeastern region and outside. We hope that this book will be used both as a text-book and reference resource at our craft training centres. We would also like to see it being used by administrators and craft promotional and development agencies involved in the development of crafts and the economic development of the region. We hope that the people of the northeastern region will take pride in their achievements and sustain this living tradition for their own benefit and for the country as a whole.